Nearly 30 million people lack access to local news in Brazil. Image: Magno Borges/Agência Mural, used with permission. This story is authored by Lucas Landin, Micaela Santos, and Paulo Talarico. It is published as part of a partnership between Global Voices and Agência Mural. On December 1, 2018, a heavy morning rain flooded the many neighbourhoods of Franco da Rocha, a town in the northern part of Greater São Paulo, in Brazil. Roads were blocked, businesses closed, and buses had to take detours in order to cross the city. “It was difficult to know how the public transport was doing when the city flooded“, recounted 20-year-old student Amanda Ferreira. “The trick was to wait for information from people who were trapped by the flood, and those who managed to get home”. The difficulty in finding information has an explanation: Franco da Rocha currently only has two news outlets. 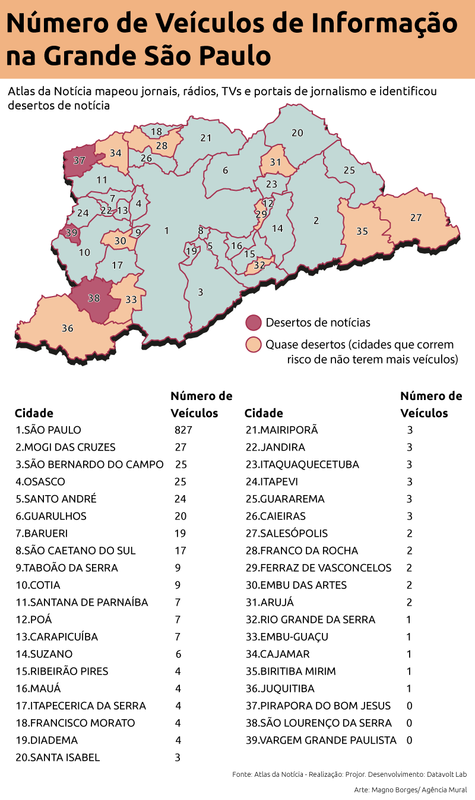 It is considered a “quasi-desert of news” by the latest Atlas da Notícia (“News Atlas”), a study that measures the number of media outlets in Brazilian cities. The study, conducted by Projor (Institute for the Development of Journalism), has published reports since 2017. Last year, it revealed that over 30 million people in Brazil have no local media coverage. In addition, it identified cities where there are few information outlets: the “quasi-deserts”. Brazil’s population is of 209 million. Greater São Paulo, the wider region around São Paulo city which includes 39 cities, has a population of 21,5 million. “I get to know about things happening in Franco da Rocha on social media and, sometimes, through the city council’s Facebook page”. And as there is a lot of information passed by word of mouth, you don’t know what is a lie or the truth”, Amanda said. Map shows the distribution of news outlets around the city of São Paulo. llustration by Agência Mural, used with permission. Over 1 million people in Greater São Paulo is at risk of having no news outlet that covers their city. At least 10 municipalities have a maximum of two media outlets (online, radio, or TV) which covers local news. Three cities have no news outlets at all: Vargem Grande Paulista (50 thousand inhabitants) in the Southeast, Pirapora do Bom Jesus (18 thousand), in the west, and Biritiba Mirim, a town of 31 thousand inhabitants in the east. 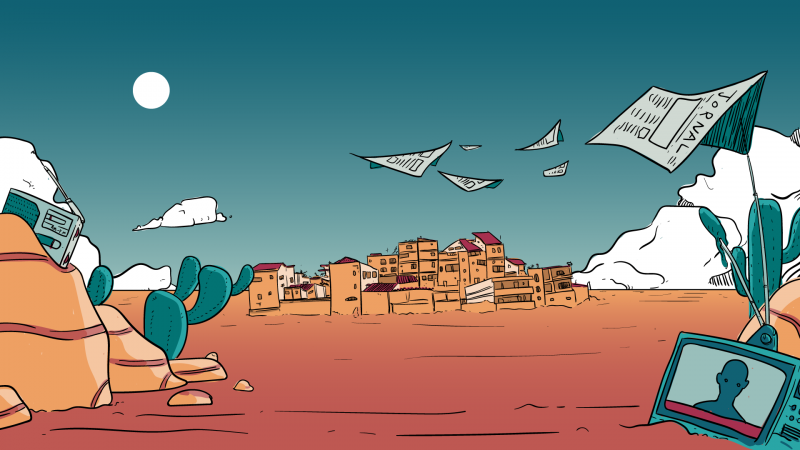 In the region of Biritiba, there are locations which are not quite “deserts,” but come close. “I receive a lot of news by the Whatsapp group of the city. As the city has no newspapers, I buy the Diário de Mogi (from a nearby town).” said retired 73-year-old Maria Aparecida Nunes, who has lived in Biritiba for 30 years. Nearby Ferraz de Vasconcelos, a municipality of 188 thousand inhabitants, has a similar situation: it only has two newspapers. The alternative is to follow the news on social media. “I usually follow the pages of newspapers from the region [based in nearby cities] and follow pages from Ferraz, like TV Cenário. I also follow directly the pages of councillors,” said 20-year-old student Renan Santos. “I only see news from Ferraz on Facebook. I usually check the page ‘Salve Ferraz’ (Hey Ferraz) quite a lot,” commented 26-year-old systems analyst Juan Pedro Morales. One factor that explains this situation is inequality, which also affects communications. Greater São Paulo has over 1,000 information outlets in total. However, 76 per cent of them are based in the capital. The other 24 per cent are spread along the region’s 38 other cities, which in turn represent 40 per cent of its residents. For comparison, São Paulo itself has seven news outlets for every 100,000 residents, while in Franco da Rocha the rate is of one for every 100,000 residents. “We get to know about things through people’s comments,” explained Márcia Pereira Cardoso, a 40-year-old resident of Franco. “People comment everything that happens in the city. I use Facebook and WhatsApp, but it’s hard to not have other outlets. If there were a news program on the radio or television about the city it would be good,” she added. “I do not usually read newspapers because I get to know about things from what people and my family tell me. When something happens, particularly if it is bad, the news spreads quickly,” said 22-year-old electrician Gustavo Correa da Silva. “It means that the population are left without the basic human right to information,” says Ângela. She explained that the survey tries to paint a picture of the overall situation in the country, so that solutions can be created to encourage the creation of local journalism projects. One of the conclusions is the link between a lack of information and a lack of good quality public services in the same towns, as well as the question of income.